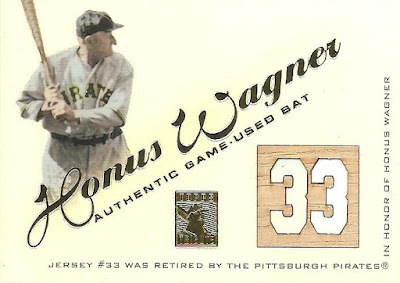 Question: What is your favorite piece of memorabilia? 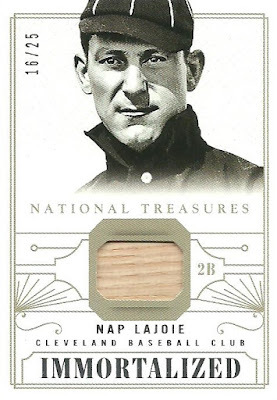 I have several pieces of baseball memorabilia that I really enjoy and I would have a hard time picking a favorite, but I'll throw that question out to you. 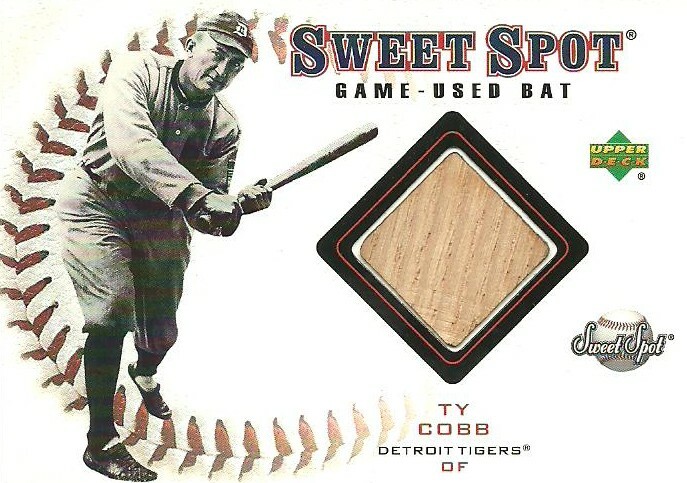 What is your favorite piece of baseball memorabilia? 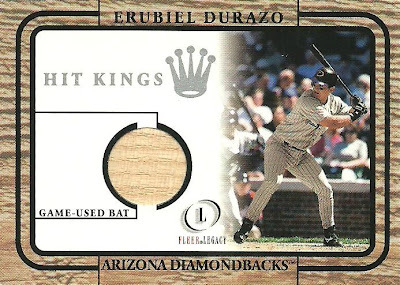 Below is one of my favorites, it's my ticket to the first ever Arizona Diamondbacks game. It was Tuesday, March 31, 1998. I was 16 years old and my brother-in-law had bought season tickets and I was lucky enough to get to go with him to Opening Day. The ticket below is a special ticket (think Sportflics) for season ticket holders that had the roof of the Bank One Ballpark open and close as you move it. I mentioned in my post yesterday that I had picked up a two card lot on eBay recently. I am offering the 1951 Bowman George Kell card up for trade. 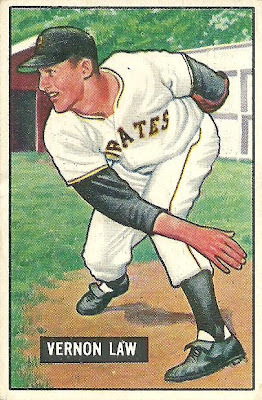 The reason I bought the lot was for this 1951 Bowman Vernon Law rookie card. My parents got me a book for Christmas called Kiss It Good-bye: The Mystery, the Mormon, and the Moral of the 1960 Pittsburgh Pirates by John Moody. It was a great book! 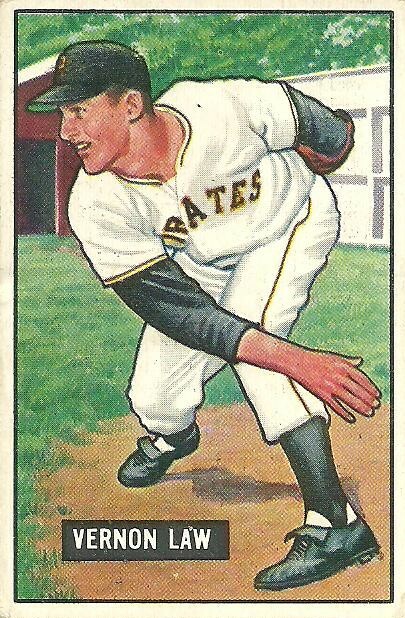 John was just a kid (6 or 7 years old) during the 1960 season so he provided details from what he remembered from that time period growing up in Pittsburgh as well as information he gained from interviewing every living member of the 1960 Pirates team. The book focuses on John's boyhood idol, Vernon Law. While reading the book, I decided to pick up a vintage Law card and I found this rookie card and feel in love with it. 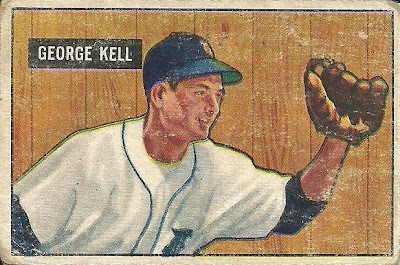 I picked up this 1951 Bowman George Kell card in an eBay auction last month. 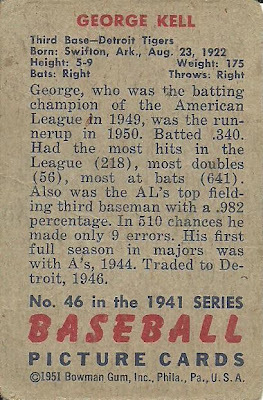 It was a two card auction, both cards were from the 1951 Bowman set. 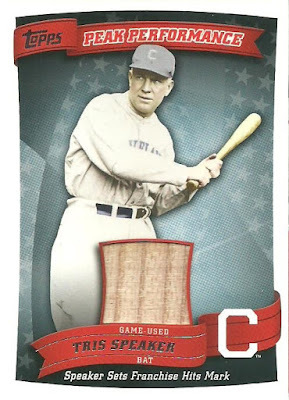 I bought the lot because of the other card, so I'm offering this one as trade bait. The condition is far from perfect but it's a great looking card that is over 60 years old. Let me know if you are interested. I'm looking for a bat card of a member of the 3000 Hit Club in return. You can see which players I still need here. I included a scan of the front and back of the card. 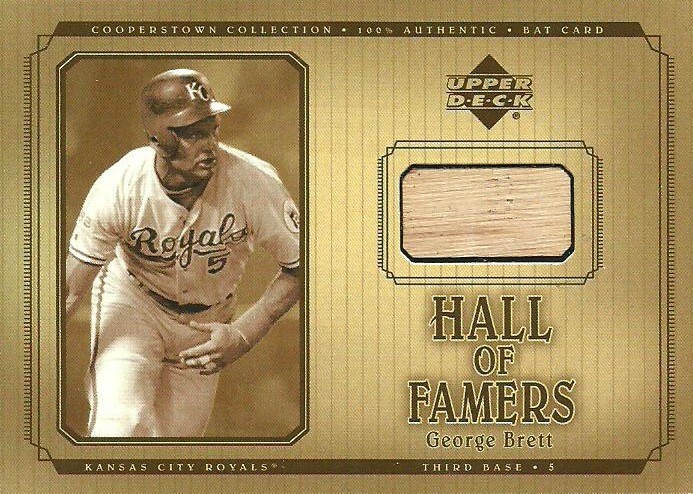 If you look in Beckett is will have an UER next to it. Just for fun, see if you can find what the error is. 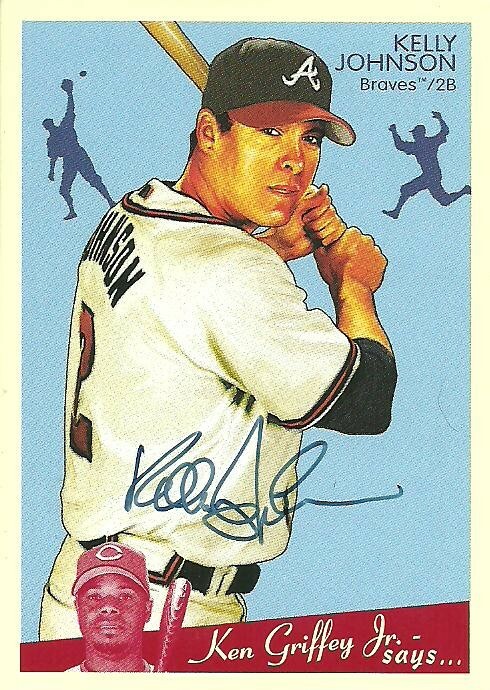 Kell was a 10 time All-Star and is a Hall of Famer. 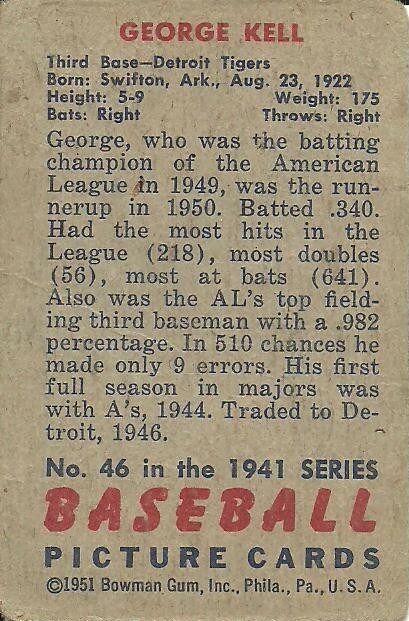 His 1949 AL batting title denyed Ted Williams a Triple Crown that year. 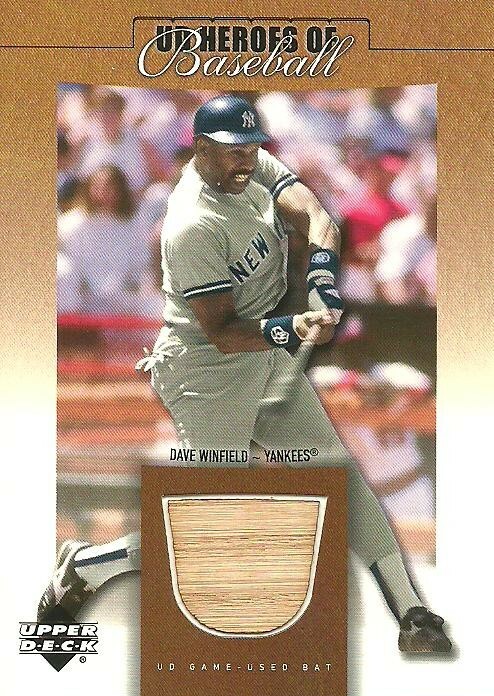 I got this 2001 Upper Deck Heroes of Baseball Game-Used Bat Card of Dave Winfield today in the mail. It was an eBay pick-up. $3.77 shipped. I picked this card up to add to my 3000 Hit Club Bat Card Collection. It goes nicely with the Wade Boggs card from the same set that I got recently. This is my 8th bat card of a 3000 Hit Club member. Only 20 to go! 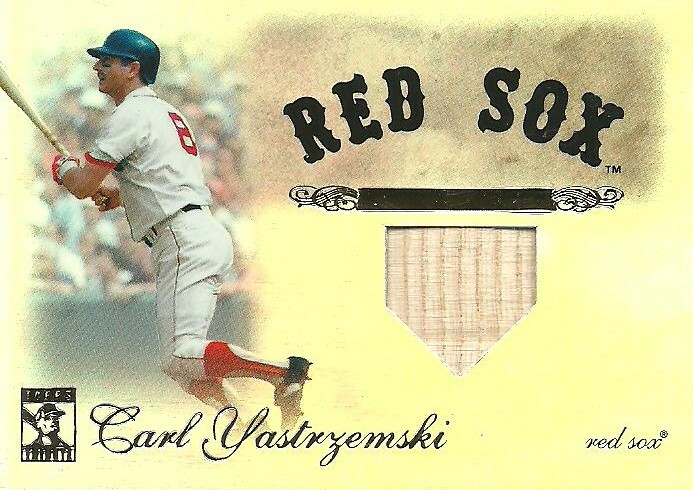 I picked up this 1957 Topps Carl Furillo card with an Ebay gift card that I got for Christmas. 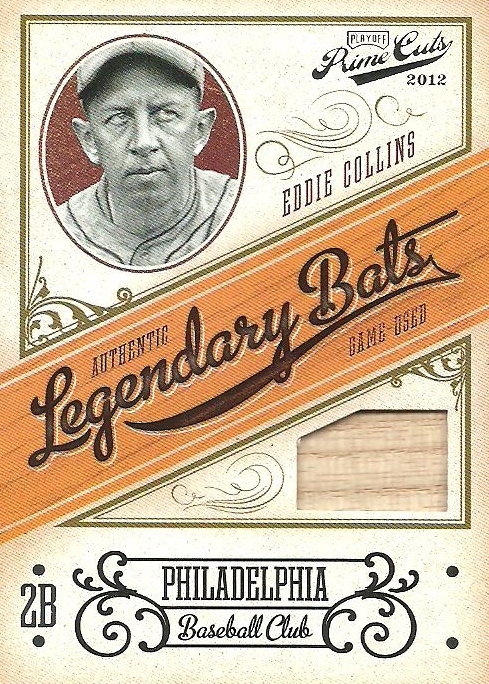 I got the card earlier this month, but haven't had a chance to show it on my blog. I actually saw this card on someone else's blog (sorry, but I can't remember which blog it was) sometime in December and fell in love with it. Look at it. Isn't it amazing! 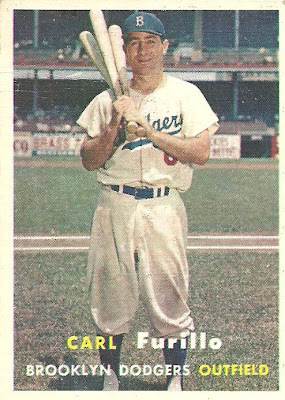 The baggy flanel uniform, the fact that it's from when the Dodgers were in Brooklyn, I'm not a stadium expert, but I'm guessing that is the famed Ebbets Field in the background (correct me if I'm wrong) and my favorite part of all, the fact that Carl Furillo, the former N.L. batting champion is holding not one, not two, but three bats over his shoulder. 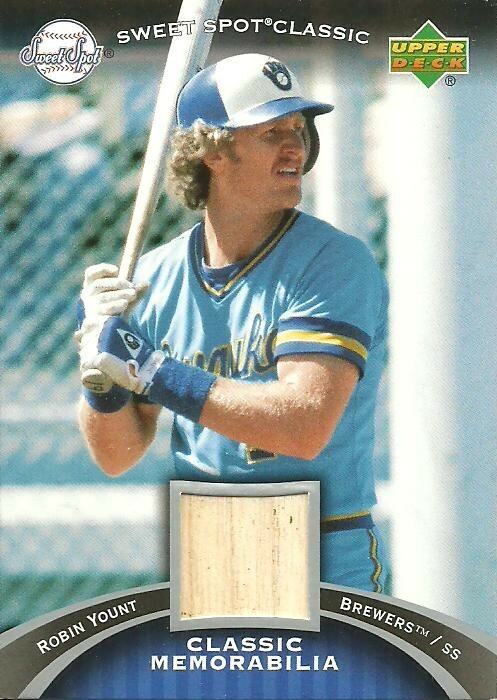 For those of you who don't know, I collect cards of players holding multiple bats. 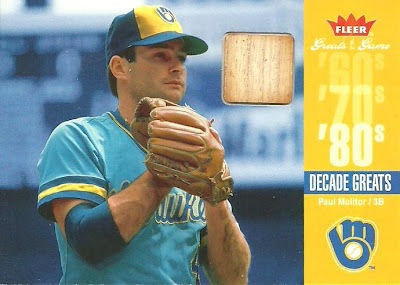 This card also fit my vintage card collecting goals for 2012. I picked up this 1980 Topps Rickey Henderson rookie card off eBay a few weeks ago. It was one of those cards that I have always wanted and when I stumbled on it on eBay I put in a bid with just a few minutes left thinking that there was no way that I would actually get it. I realize that it is a PSA 6, but as I've mentioned before, the grade/condition is not the most important thing for me when it comes to vintage cards...and yes, I consider 1980 vintage. I won it with a bid of $15.50 and paid $4.95 for shipping. I need to watch a few more YouTube videos before I try to bust open the case, but I do plan on setting it free eventually. 1) It's a triple relic card for $2 bucks. 2) I love the fact that the piece of football has writing on it. 3) John Beck is a local guy (attended high school in Mesa, AZ). 4) It's numbered on the back 19/50. 5) I could always put it on eBay and probably get my $2 back if I wanted to. 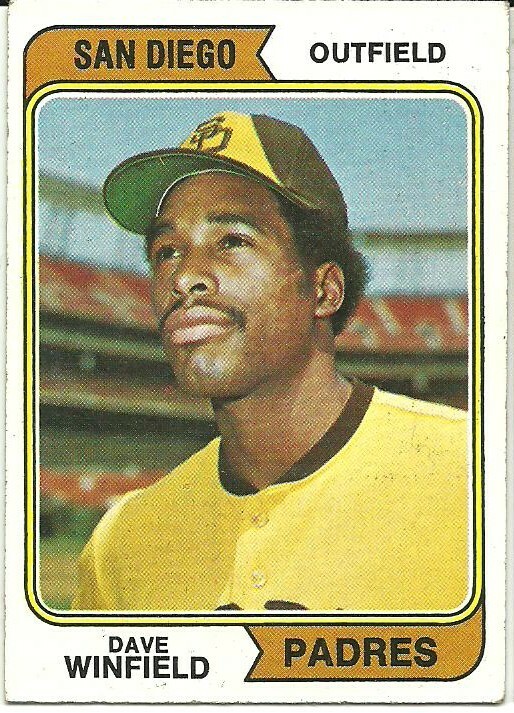 I picked up this 1974 Topps Dave Winfield Rookie Card this past Friday at my local card shop. I've wanted this card for a while. My brother-in-law had this card from when he was a kid and I've always liked it. Now I have one of my own. 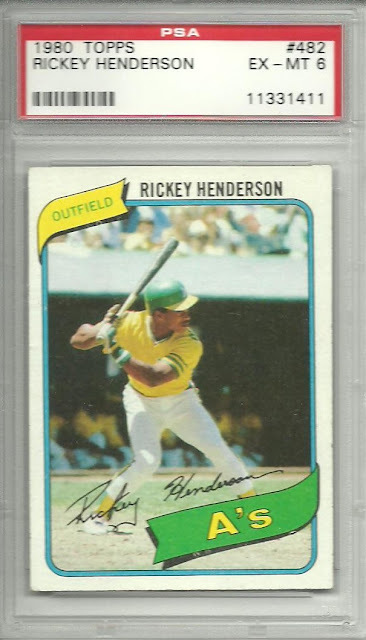 The condition is not perfect (I didn't crop it real close so you could see the corners and edges), but I've mentioned before that for me, when it comes to vintage, condition is not all that imprtant to me. 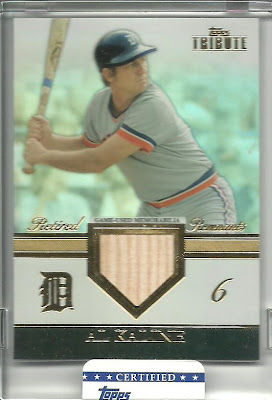 This card definitly fits my vintage goal that I set as part of my 2012 Card Collecting Goals. 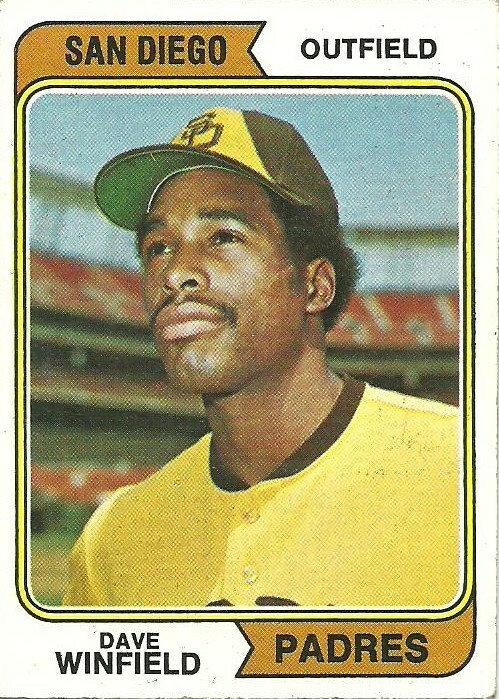 I never knew, or had forgotten, but Winfield was a pitcher in college, and a darn good one at that. He was the 1973 College World Series MVP as a pitcher, before being drafted by the San Diego Padres (MLB), Minnesota Vikings (NFL), Atlanta Hawks (NBA), and Utah Stars (ABA). I'm glad he choose baseball! 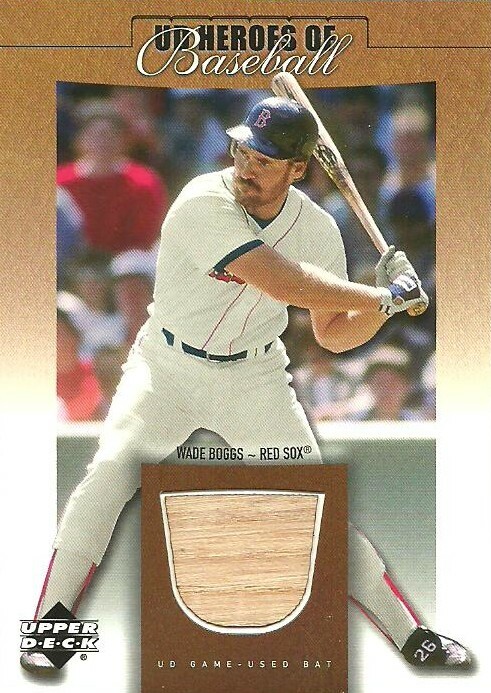 The relic card that I picked up on Friday at my local card shop is a 2001 Upper Deck Heroes of Baseball Game-Used Bat Card of Wade Boggs. 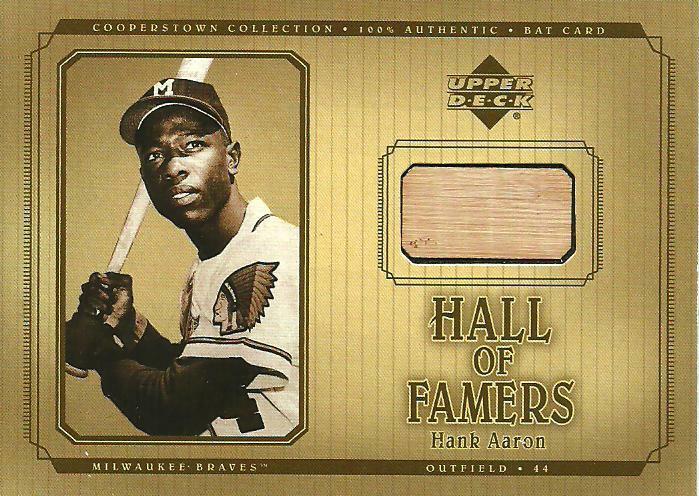 I picked this card up to add to my 3000 Hit Club Bat Card Collection. 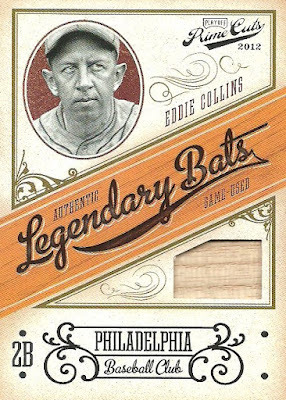 This is my 7th bat card of a 3000 Hit Club member. Only 22 to go! Yesterday I stopped at my local card shop, AZ Sports Cards. The owner had recently bought a collection and had some nice vintage stuff at good prices. He also had a dealer that he had not heard from in over a year, so he decided to liquidate his stuff, with lots of rookie cards, jersey, and auto's for a buck each. There was another case that had just reduced their prices as well, so I took advantage of the current situation and picked up three cards. I didn't realize until this morning that I had picked up an auto,a relic, and a rookie card: a trifecta. 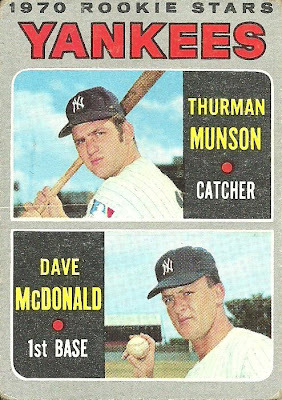 The trifecta though is not of the same player. I'll start by showing the auto. It's a 2008 UD Goudey Kelly Johnson Goudy Graphs Auto. 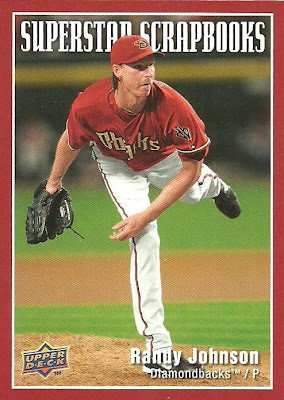 Kelly spent the 2010 season and most of last season with the D-Backs before being traded to Toronto. I'd really like an auto lic of Johnson as a D-Back but I'm not sure if one exists. 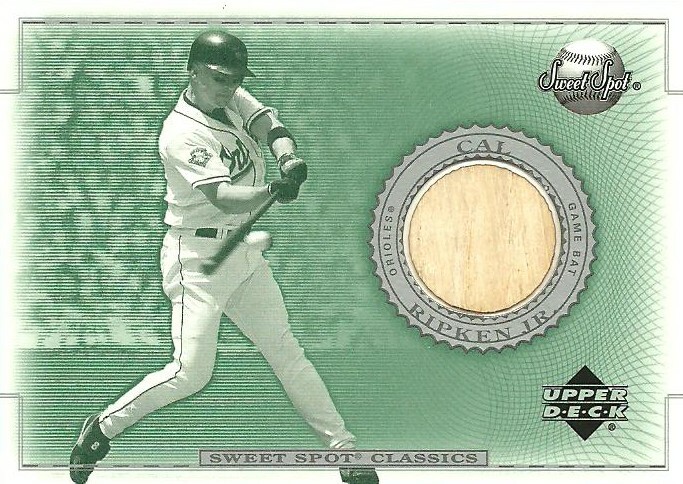 He does have a few D-Backs jersey carrds from this years Triple Threads and Marquee though, so if anyone out there has a Kelly Johnson D-Backs auto or jersey cards and wants to trade for this one of him in a Braves uniform, let me know. 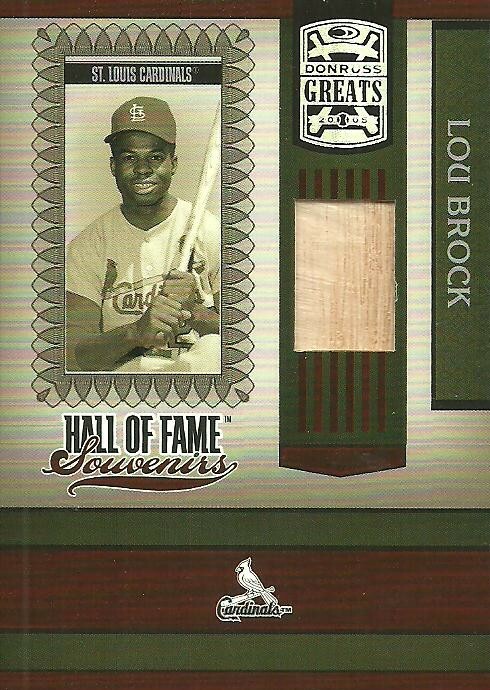 I'll show you the relic (3000 Hit Club Bat Card) and the rookie card (HOF) that I picked up over the next couple of days. 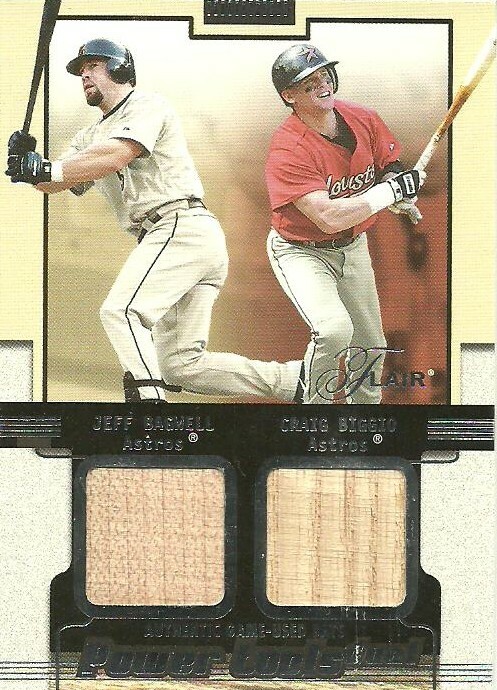 I picked up this 2002 Flair Power Tools JEFF BAGWELL/CRAIG BIGGIO dual bat card at a card shop last weekend. Bagwell didn't make the cut for the Hall of Fame this year, but it's looking like he will get in in the near future. 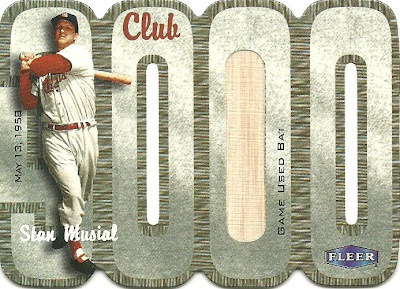 Biggio is a member of the 3000 Hit Club so he should get in as well. His first year of eligibility is next year, so it's possible that both Bagwell and Biggio will both be elected to the Hall of Fame next year. For just $2 it was impossible to pass on this card. 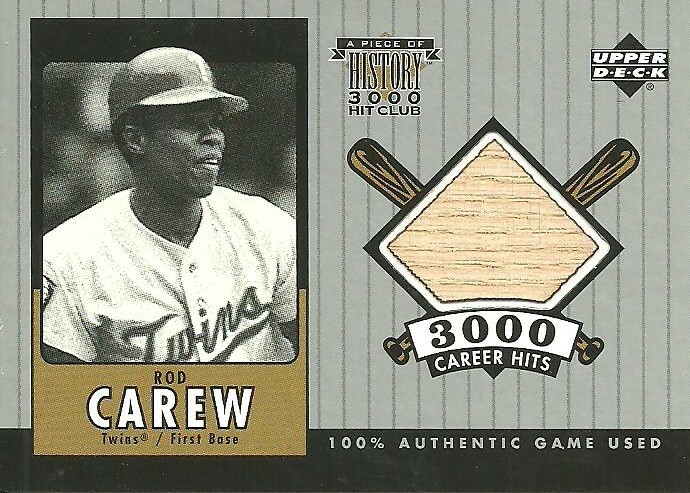 Because this bat card features two players, I don't really consider it as a card for my 3000 Hit Club Bat Card Collection. 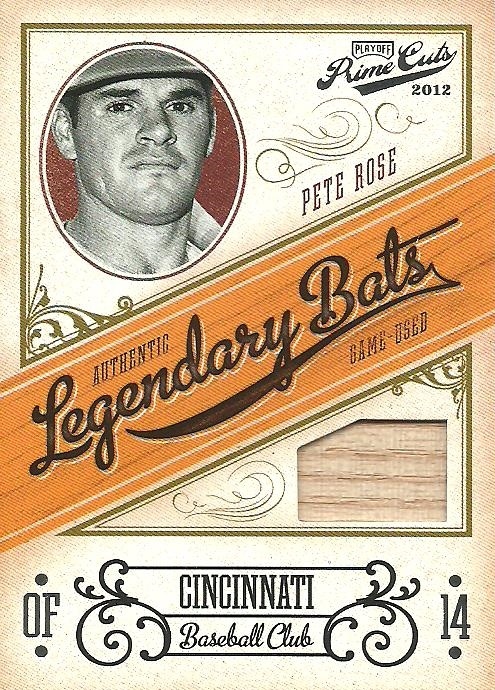 I'll have to pick up a bat card of just Biggio. Here's another card I picked up at a card shop this past weekend. 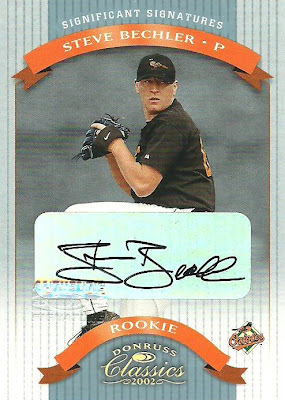 It's a 2002 Donruss Significant Signatures card of Baltimore Oriole pitcher Steve Bechler. 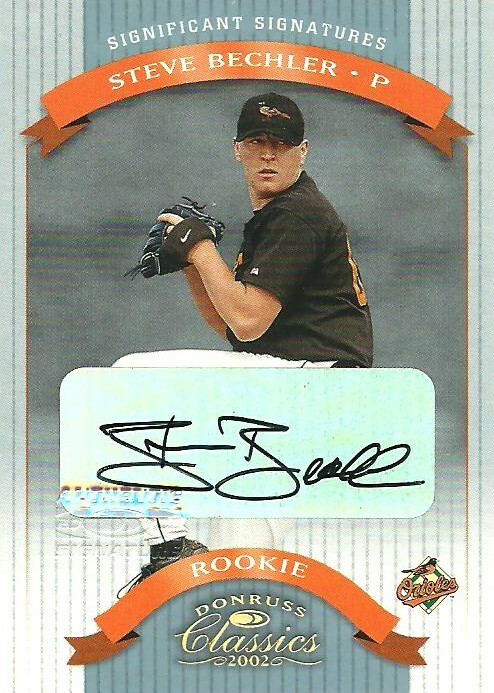 Bechler was a pitching prospect that died of heatstroke during Spring Training 2003. Sad story. 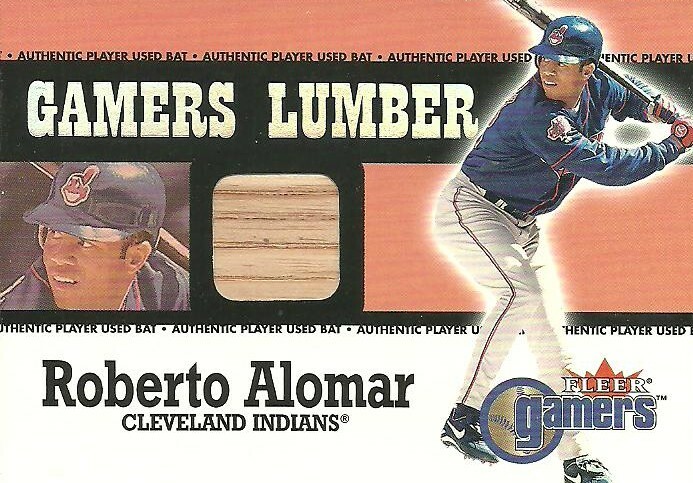 I picked up this 2000 Fleer Gamers, Gamers Lumber, Roberto Alomar Bat Card at a card shop this past weekend. 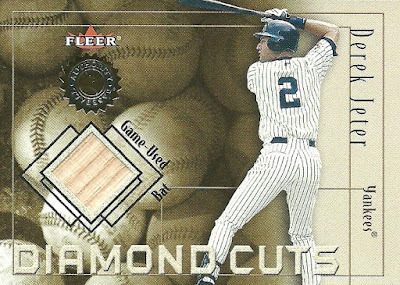 I remember when these cards first came out and I've always really liked the layout and design of the cards. I picked this up because Alomar just got into the Hall of Fame last year and I don't have any memorabiia cards of his. 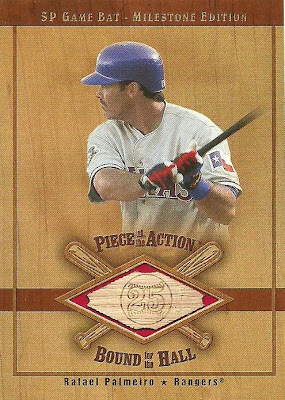 If someone wanted to trade for this card though, I would be willing to listen to trade offers. I picked up this 2001 Fleer Legacy ERUBIAL DURAZO Hit Kings Bat Card at a card shop this past Saturday for $2. Happy Martin Luther King Day! Hope everyone is enjoying the holiday! I've posted about a couple of things that I have gotten for free on listia.com. When I signed up for listia I got around 500 free credits. 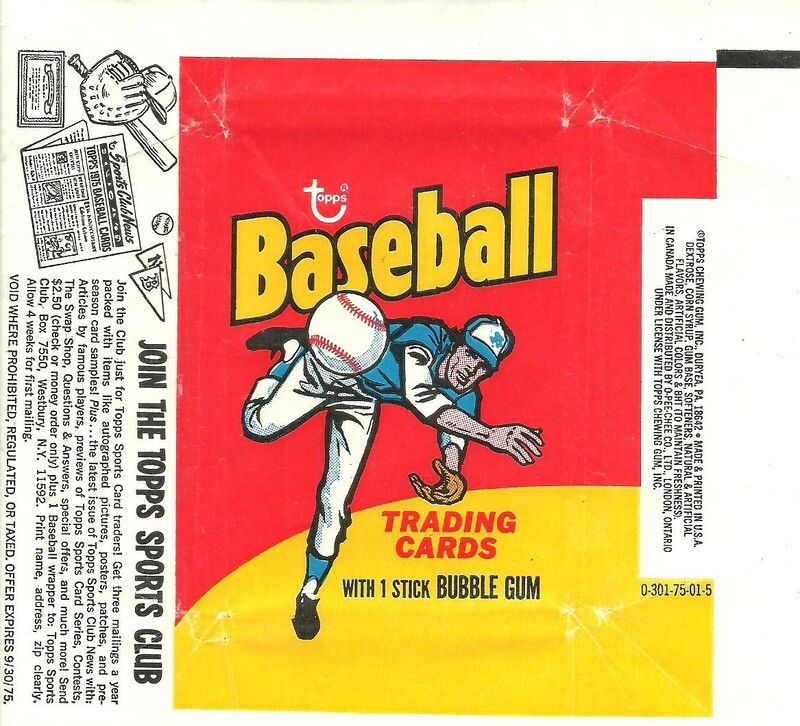 I used those to get a two card Randy Johnson lot and what was suppossed to have been one 1975 Topps wrapper (it turned out to be three 1975 Topps wrappers). I used the last of my free points to get this 2000 Upper Deck Legends Randy Johnson card. Now I have to decide if I want to start selling on listia to get more points so I can bid on more items. I used some of my ebucks to get this 2011 Topps Update Miguel Montero All-Star Workout Jersey Card off eBay recently. 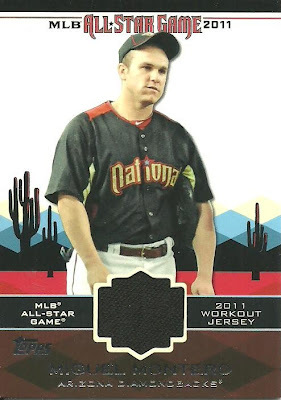 I had been wanting this card since I already have the Upton card and he and Miguel Montero were the D-Backs representatives in the 2011 MLB All-Star game which was held in Phoenix and that I got to attend. Now I need the parallel version numbered to 60. If you have one and are willing to trade it, let me know. Thanks! 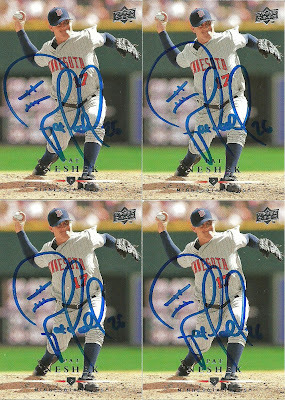 I sent out these 4 2008 Upper Deck cards to Pat Neshek on 1/3/12 and recieved them back signed on 1/12/12. 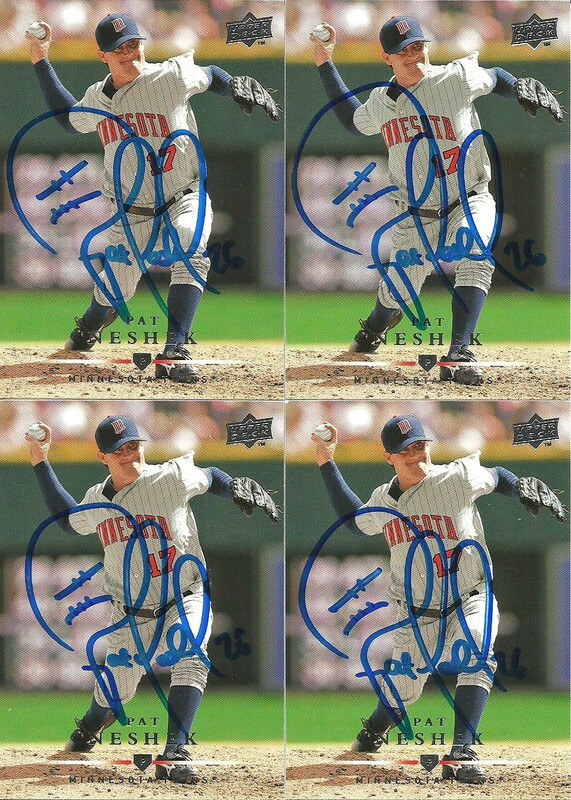 Pat is not only a Major League Baseball player, but he's also an avid baseball and hockey autograph collector as well. He has his own blog, On The Road With Pat Neshek. I love how he turns his "P" into a baseball. 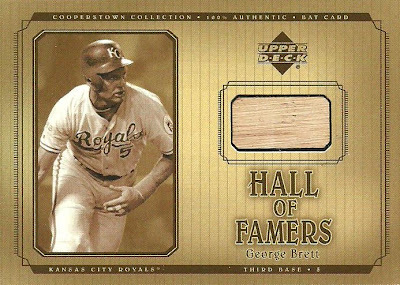 I had 4 of these cards and so it works out good because I have 3 boys, so I get one and each of my boys will get one for their collection. Thanks Pat! I won this 1975 Topps wrapper, and two others just like it in a listia.com auction. I thought the auction was for only 1 wrapper, but when I opened up the envelope on Wednesday of this week, there were 3 wrappers. If anyone is interested and would like to trade me for one of my extras, just let me know. Thanks! Kinda weird watching yourself on video for the first time. I'll go ahead and start by making fun of myself. I've found that if you make fun of yourself first, it hurts less when others do it later. So, what's up with my head bobble while I'm stating my blog name? And boy my face looks fat. Other than that it seems like it worked. Good for me, but bad for everyone else because you'll be seeing my ugly mug more often. 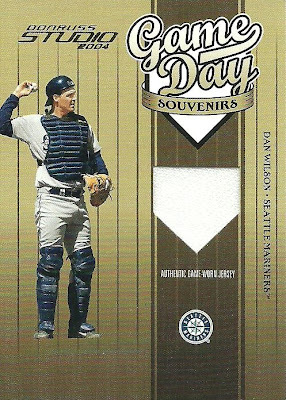 One of my 2012 Card Collecting Goals was to get a trifecta of Dan Wilson, since my name happens to be Dan Wilson as well. 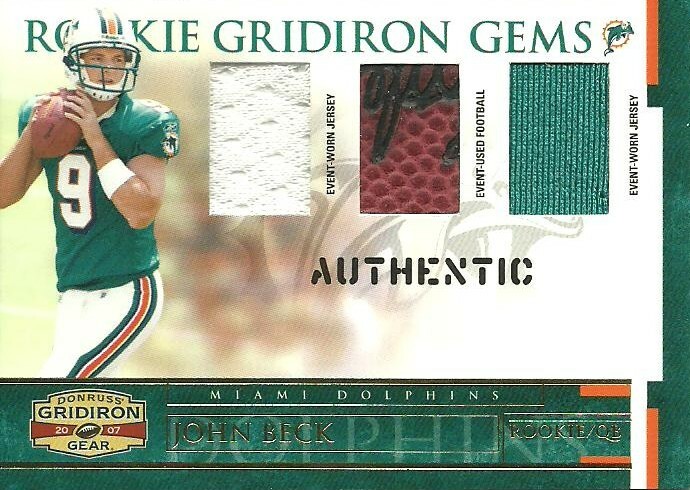 I already had a Rookie Card and I was able to get an Auto and Jersey card off eBay pretty easily. So, I picked up two final cards for my New Years stocking off eBay and they arrived this past Saturday. 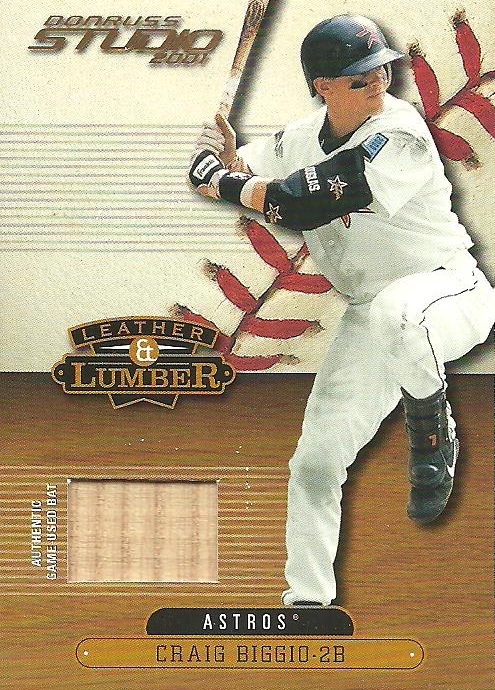 The first one completes my Dan Wilson trifecta, which I will showcase in my next post. 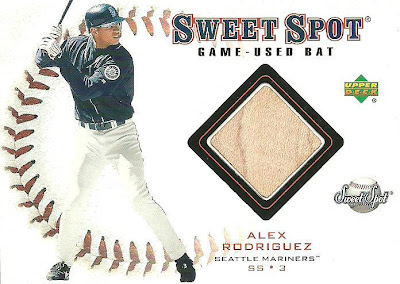 It's a 2004 Donruss Studio Game Day Souvenirs Jersey Card. 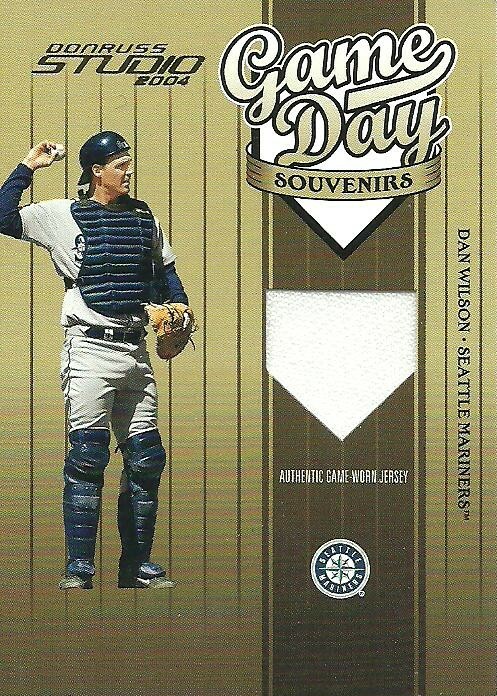 Dan Wilson dosen't have a ton of different relic cards out there, so when I saw this on eBay, I jumped on it. I got the second card from the same seller for cost because shipping on 1-4 cards was $3. So, I picked up this 1998 Upper Deck Retro Sign of the Times Travis Lee Auto for $2 bucks. Lee was probably my favorite Diamondbacks player back in 1998 and 1999, so it was cool to pick this up. I came across listia.com a week or so ago. It's a web site where you put stuff up for auction, but instead of using money to bid, people use credits. You can then use your credits to buy things on the site from other people. Most of the auctions I saw had free shipping, but I think there is an option to have the buyer pay shipping costs. 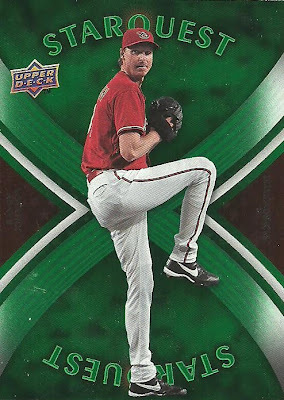 I signed up and got around 500 free credits and quickly won an auction for the 2 Randy Johnson cards below. Not too shabby, since I got them for free. I recieved them in the mail a few days later. It's kind of a cool concept. Not sure how much I'll use it though. If you've used listia before let me know what your experience has been. Thanks! In an effort to help Santa fill my stocking on New Years morning, I made a few eBay purchases that are arrived last week. This is the second card that came. 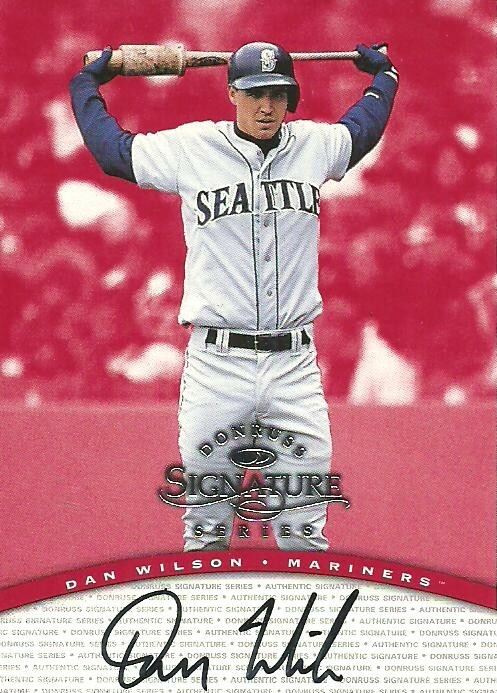 I got this in an effort of completing the Dan Wilson Trifecta (RC, Auto, Relic). It's a 1997 Donruss Signature Series Auto. Again, my name is Daniel Wilson, so one of my 2012 Card Collecting goals is to get a trifecta of me, I mean, Dan Wilson the baseball player. Congratualtions to Barry Larkin on being elected to the Baseball Hall of Fame! I posted last week who I would have voted for and Larkin was on my list. I also mentioned that I thought he would be the only player elected today...and I was right. I still think there are some very deserving candidates out there, so we'll have to wait until next year to see what happens. I used an eBay gift card that my wife had gotten me for Christmas to purchase my first 3000 Hit Club Bat Card since deciding to take on the challenge of collecting a bat card of every member of the 3000 Hit Club. 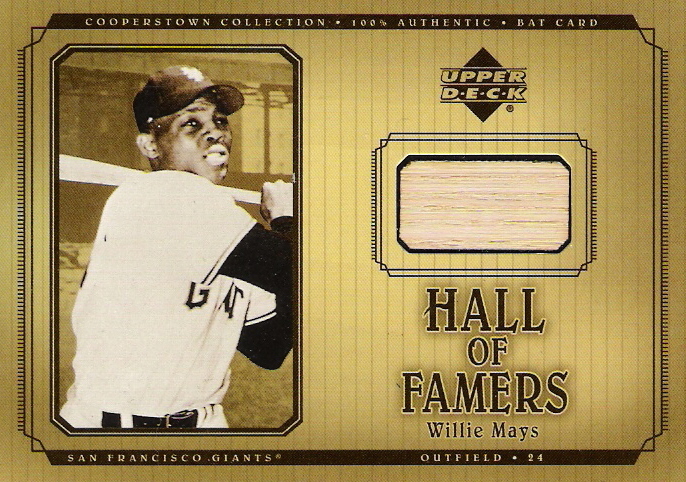 I spent a little more on this particular card because it is actualy from Upper Deck's Piece of History 3000 Hit Club set and those cards usually command a premium over other bat cards of a particular player. This card is of Hall of Famer PAUL WANER. 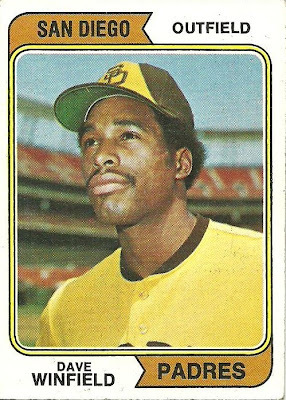 This might be a name that most of you don't recognize. 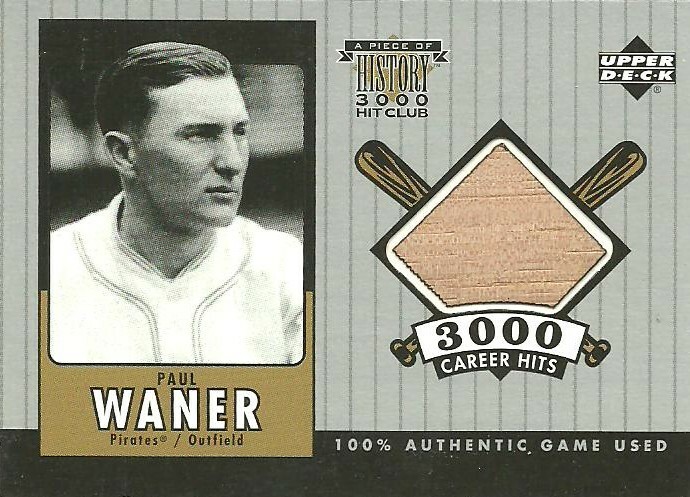 Paul spent the majority of his 20 major league seasons (1926 - 1945) with the Pittsburgh Pirates, but also spent time with the Dodgers, Braves, and Yankees. 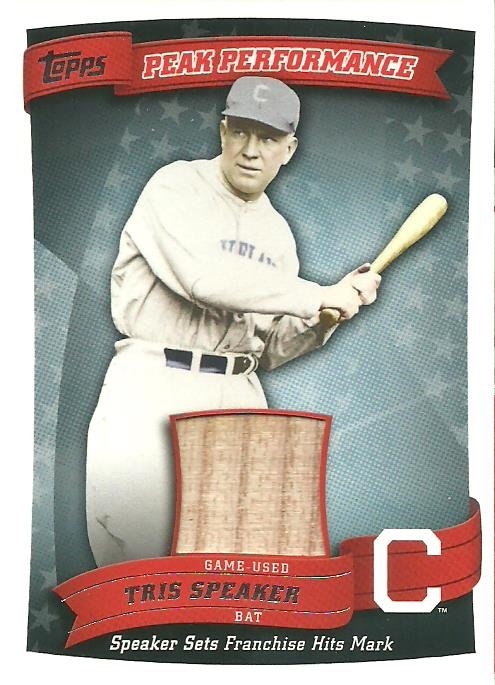 He had a career batting average of .333 and was the 1927 NL MVP. 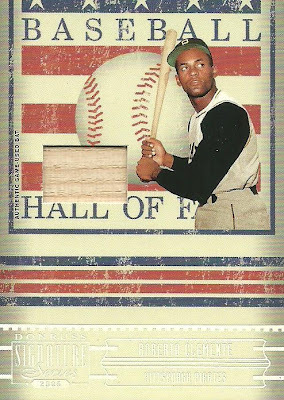 With the Baseball Hall of Fame votes being announced on Monday, January 9th, I thought I would share with you who I voted for. Okay, so I don't get an offical vote, but here is who I would vote for if I did. Notice I used all 10 votes. In no particular order. 1. Jeff Bagwell - Has a ROY and MVP award. 449 career home runs and never actually linked to steroids. 2. 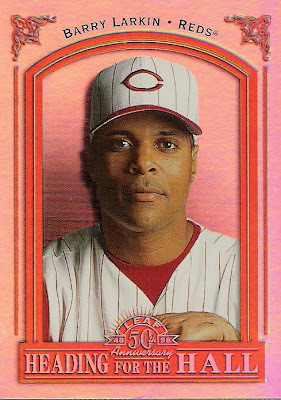 Barry Larkin - 12 time all-star and winner of 1995 NL MVP award as a shortstop. 3. Don Mattingly - 2,153 hits in just 14 seasons and a career .307 batting average. 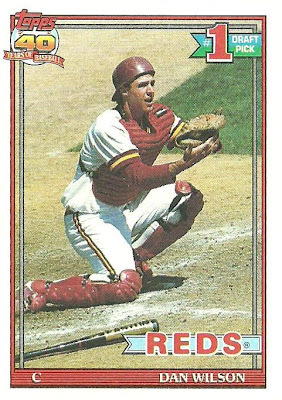 1985 AL MVP. 4. Dale Murphy - Back to back MVP awards in 1982 and 1983. 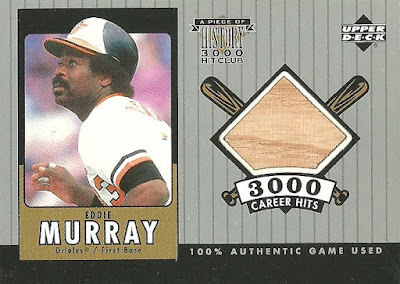 398 career home runs. 5. 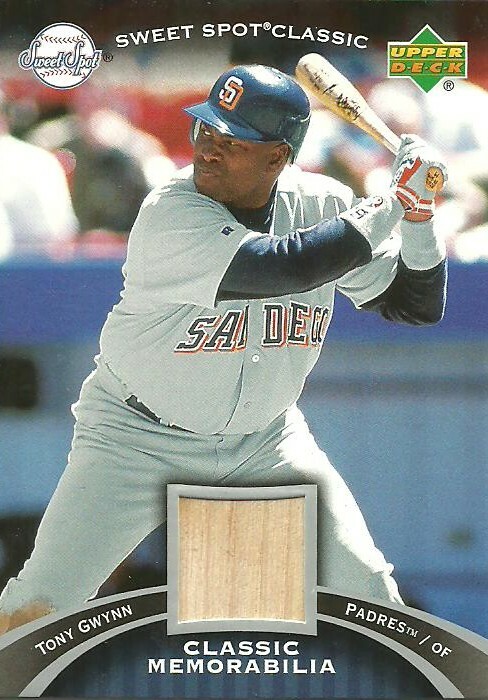 Fred McGriff - 493 career home runs and never linked to steriods. 6. 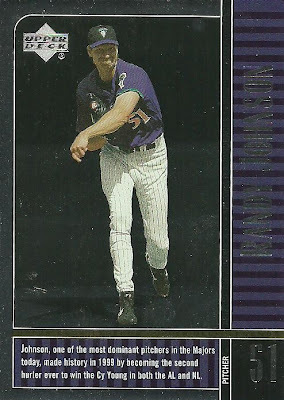 Larry Walker - .313 career batting average, 7 Gold Gloves, and a 1997 NL MVP award. 7. Tim Raines - 2,605 career hits and a lifetime batting average of .294 over 20 seasons. 808 stolen bases. 8. Jack Morris - 254 career wins. 9. 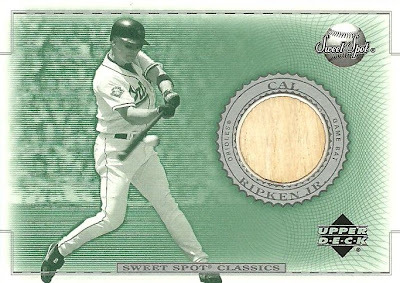 Alan Trammell - 2,365 career hits. 6 time all-star. 4 time Gold Glove winner. 10. 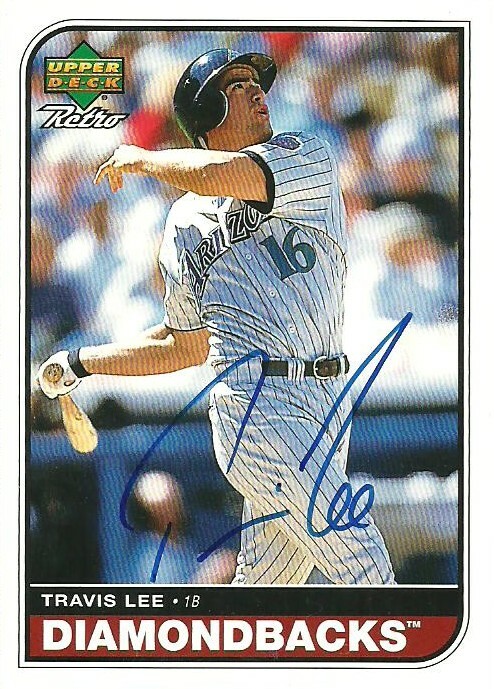 Edgar Martinez - .312 lifetime batting average. 7 time all-star. 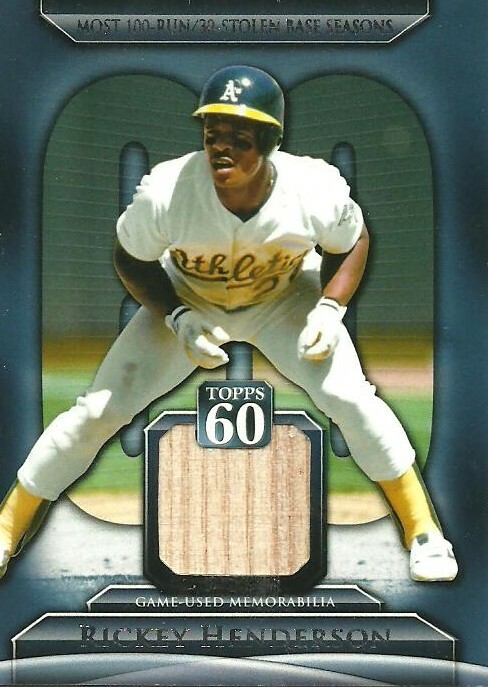 One of the greatest Designated Hitters of all-time. Okay, so there's my vote. But now, who do I actually think will get in. Barry Larkin. I think he will be the only one voted in this year and it wouldn't actually surprize me if nobody made it. How about you? Who would you vote for and who do you think will get voted in this year?